If you have been to the Eckelmann-Taylor Speech and Hearing Clinic lately, you might have noticed the new addition: a piece of artwork, created with string art and adorned with the message “everyone deserves a voice” is now hanging on a main wall of the clinic. This piece of art was created by second year Master of Science speech-language pathology graduate student Kelly Gorney, and her reason for creating it is very meaningful. This past February was the 10th anniversary of the shooting at Lane Bryant in Tinley Park, where a gunman disguised as a delivery man shot five innocent women, one who was Kelly’s neighbor, Sarah Szafranski, who was only 22 years old at the time. In her memory, the family asked those close to Sarah to do a “random act of kindness” to honor her. For her random act of kindness, Gorney wanted to do something that was meaningful to her at this point in her life and to clients who come to the clinic. Gorney decided specifically to donate to the Speech and Hearing Clinic because of her appreciation of the experiences she has had as a student and her part in the process of helping others find their voice. She created this piece of art as her random act of kindness because she loves the “everyone deserves a voice” saying and knew it was applicable to the clients in the clinic. Gorney liked that her artwork gave Szafranski a voice and shares her story so, hopefully, other people will choose to act kindly. 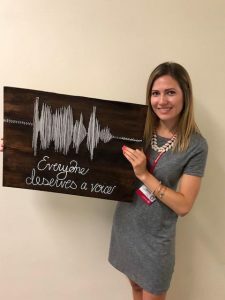 Once she decided on the string art, Gorney asked Cara Boester, director of clinical education for speech-language pathology, about her idea, and Gorney received immediate support. The artwork has been well received by students and supervisors in the clinic. “I loved that Kelly thought to honor the clinic by paying it forward,” Boester said. She said the artwork was amazing. This piece will be enjoyed by clients and graduate students for years to come.